Public awareness of Traumatic Brain Injury (TBI) is growing. That’s a good thing. Unfortunately, disability and the need for care of people with TBI is also growing. Sports-related injuries, war trauma, whiplash or concussion in an auto accident, even toxic chemicals and stroke can result in TBI. For a loved one who wants to understand these difficulties, read, 5 Things Every TBI Survivor Wants You to Understand. I am myself a TBI survivor. I had the normal struggles with memory, reasoning and judgment, like others with TBI. In addition, I had lost social and emotional skills. That made me feel cut off from the world, from humanity. Eventually, I found that body awareness was the key to regain emotional intelligence. I first watched others carefully. Then I noticed my own body shifts. Gradually, I learned to recognize my own emotions, then emotions in others. I became a massage therapist in 2009. Soon, I noticed one of my TBI clients benefited from learning the bodywork and mind-body practices I taught him. This intrigued me–how did it happen so quickly for him? So I enrolled in a year-long course in 2012: Functional Neurology for Bodyworkers. And the light went on. 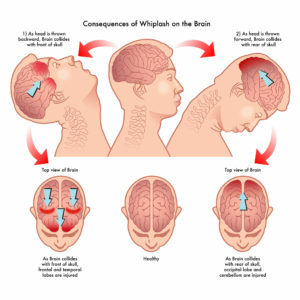 How can touch therapies or Ortho-Bionomy® help with TBI? 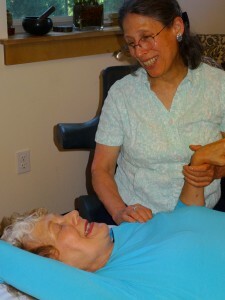 Massage and touch therapies are not just skin deep. Sense receptors, fascia and lymph tissues under your skin are well supplied with nerves. They communicate with other nerves and tissues all over your body. Consequently, touch affects not just muscles, but also mood. It brings benefits for pain, as well as your brain. It can stimulate joint movement, as well as gut movement. The brain’s limbic system, which regulates emotions, may be affected by a TBI. Fortunately, it’s a two way street. It also receives signals from body sensations. Your brain interprets those signals. When you receive gentle, focused touch, your whole body relaxes. Your brain gets the idea. It perceives comfort and safety, so you can heal emotionally. To support your healing, I listen to you. I ask what you want. Together, we identify your goals, and what is reasonable to accomplish each session. I then work with you to meet your goals. This sense of moving in the direction of benefit activates your brain for healing as well. I also use touch and ask you to notice how sensation is connected to your emotions. This gives you access to a tool for change that you always carry around with you–your own body. Body awareness allows you to connect with your feelings, and improve your mood. This is sometimes called interoceptive awareness. It can be a huge relief to finally have that emotional roller coaster under control again. Meditation and mindfulness training are growing in popularity. And for good reason. They help people with high blood pressure, anxiety, depression, various chronic diseases and pain. Is it any wonder they also help the brain? Not only does meditation improve happiness, it also improves altruism, our social glue of caring. More importantly, for people with TBI, research shows that mindfulness training decreases mental fatigue, improves quality of life, and reduces depression. And it even helps TBI family members and care partners cope better with stress. If you don’t already have a meditation practice, I suggest gentle breathing exercises. Perhaps mindful walking, yoga, Tai Chi or QiGong. Or gardening, playing with your dog, nature hikes, music or art. 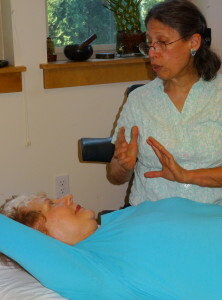 Ortho-Bionomy® bodywork and mind-body exercises are done fully clothed for your comfort. I also look for other ways your body can find greater ease and balance. For example, I might ask you to compare sensation between your left and right shoulder. Then I ask you to notice what happens as I move your shoulder. I will explain the Ortho-Bionomy® principle behind the release of shoulder tension to make sure you understand. Soon, you learn to position your body for comfort yourself. Getting comfortable sends your brain a signal that it’s safe to heal, essential for recovery from the trauma of TBI. If you are a TBI survivor or family member, I invite you to call me with questions or a free consultation, 503-708-2911. 3 Traumatic brain injury patient-reported outcome measure: relevant health-related quality-of-life issues. This entry was posted in About Rosi, Body-Mind, Brain Injury/TBI, Emotions, Neuroplasticity and tagged bodywork, functional neurology, healing, massage, neuro massage, Ortho-Bionomy®, pain relief, somatic interventions by Integration Massage. Bookmark the permalink. Hi, it’s fifteen month since my TBI and I’m really suffering with emotional lability issues that are deeply affecting my wife and kids. I’m medicated, know CBT and the whole nine yards. But, they aren’t working. I’m wondering what kind of massage therapist I should be asking for in Perth Western Australia. Can you help please? I don’t know of massage therapists in Australia trained in Functional Neurology. Mary Hitchcock is a practitioner of Ortho-Bionomy, in Perth (I think), and you can reach her at mary@sacredwhispers.com.au. They say, “The Institute works closely with medical and other health care practitioners to find solutions to neurologic cases which are not responding satisfactorily to established treatment protocols, and directly with patients for whom a medical diagnosis is inconclusive.” This seems to match part of what you described. I wish you and your family the best, with my whole heart. I know it can be a long journey. Let me know how it goes. Rosi, this is very inspiring. I am a fellow survivor and certified DFA practitioner and LMP. I completely agree with your approach to the brain via the body. I use breath, visualizations, gentle touch, lymphatic work, jostling, and alignment exercises to help increase sensory awareness and decrease the sensitization of the nervous system in my own practice. Do you have any advice for breaking into the field and getting my name out there? Having come to the other side of my own MTBI I am trying to figure out how to work with the community, and build my private practice. Your work sounds similar in approach to mine. Welcome to the field! It helps to have my own personal experience and recovery as a touchstone to relate to clients. I’m sure you will find this to be true for you. As for breaking into the field, massage is well known to relieve stress, induce relaxation and healing. The kinds of techniques you and I practice–bodywork to regain emotional self-control–is less well known. Most people feel helpless when they have had a TBI or ABI, and even head injury treatment centers advise families to not expect a full recovery from frontal TBI. When we add breathwork, and empower people to increase awareness through movement, to regain voluntary control over unconscious muscle tension, it sometimes makes it possible for people’s brains to process information in new ways. However, well-documented research is needed to back this up, to increase the scientific validation of what we do, and increase public knowledge. I can’t advise you on marketing or increasing your practice, but I do suggest learning the science behind how bodywork can beneficially assist head injury recovery, so that you can speak knowledgeably with medical professionals and the public. Would you consider writing up a case report of one of your cases? I know it is time consuming, but the research and writing skills I have acquired provide depth to communication with patients, practitioners, and support groups. Rosi, thanks so much. I completely agree about the significance of breath and movement in the healing process. One of my colleagues Brigitte Hansmann in Barcelona is working on research about breath and water/blood chemistry, which is fascinating. in My own experience led me to bodywork via fascination with healing brains. I am definitely trying to learn all I can about the science that is out there. So far the most influential works have been Rick Hanson on Buddha’s Brain, Candace Pert Molecules of Emotion, and Norman Doidge The Brain that Changes itself, I am eager to read his new books. I am currently trying to write down the pattern I’ve seen in clients I’ve worked with. Though I’m thinking the first version will be geared toward survivors and their families rather than medical professionals.